The company was chosen in part for its environmentally friendly solutions, green manufacturing process and continued dedication to supply chain sustainability. This is the fifth year TMHU has been named to the list - every year since the award's inception. 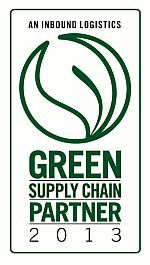 "The Green Supply chain list honors companies that have made sustainability a priority, and continue to push the needle in terms of innovation and execution," explained Felecia Stratton, editor for Inbound Logistics. "Toyota, for a fifth consecutive year, was recognized for creating an organizational culture where sustainability permeates all aspects of its manufacturing processes, extending to its suppliers as well." "Toyota operates under a global earth charter that promotes environmental responsibility throughout our entire company," Jeff Rufener, president of TMHU said. "At every stage of the production cycle - from raw materials and parts procurement to manufacturing and recycling - Toyota minimizes the environmental impact of every product." The Green 75 feature is designed to provide decision support for Inbound Logistics' readers who seek to do business with sustainable providers. To be eligible for the ranking, companies must provide logistics services with an emphasis on eco-friendly solutions.